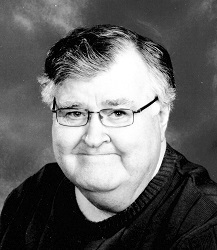 Robert Jack Vernon, 78, of Abilene, passed away on December 19, 2015 in Abilene. Visitation will be 5-7 p.m. on Monday, December 21, 2015 at Hamil Family Funeral Home 6449 Buffalo Gap Road, Abilene. Funeral services will be held 2 p.m. on Tuesday December 22, 2015 at First United Methodist Church, 202 butternut with Pastor Jeff Zirkle officiating. Burial will be at Rogers Cemetery in Ovalo. Arrangements are under the directon of The Hamil Family Funeral Home. Robert was born on the family farm in Rogers Community to Roy and Norene Whiteaker Vernon on November 5, 1937. He went to school in Ovalo and graduated from South Taylor High School. Robert attended Cisco Junior College. He was a long time employee of Snapshots, then was assistant manager at UA Cinemas in the the Mall of Abilene for 20 plus years. Robert was preceded in death by his parents Roy and Norene Vernon and a brother Tommy Vernon. Robert is survived by one nephew, Charlie Vernon and wife Amanda of Ovalo, one niece, Debbie Vernon of Abilene, one sister in law, Peggy Vernon of Abilene, one great nephew Roy Vernon and wife Tate of Stephenville, two great great nephews; Hudson and Hayden Vernon, and many loved cousins and friends. Pallbearers will be Jerry Vernon, Kenneth Whiteaker, Roger Whiteaker, Ross Whiteaker, Randy Vernon, James Walsh. Honorary Pallbearers Bill Vernon, Tommy Thornlee, Ronnie Stice.